I was about eight when I first attempted to read the Narrative Life of Frederick Douglass, an autobiography of the great 19th-century activist. My father had brought me along on one of his frequent excursions to a used-book store in Annapolis, Maryland, where the book caught my eye. Douglass — a famed orator, author, and newspaper editor — fought against slavery and championed racial justice, women's rights, and equality for all Americans. In southeast Washington, DC, Frederick Douglass National Historic Site preserves the activist's final home, where lived for 18 years. Born a slave on Maryland's Eastern Shore, Douglass was separated from his mother as a baby and never knew his father. I read about his early childhood but closed the book when Douglass shared a trauma that he experienced when he was about my age. I quit reading at this point — it was just too much for me. Eventually, I finished the book. In years since, I've re-read the Narrative many times; as a student, a teaching assistant, and a park guide at the home he called Cedar Hill — Frederick Douglass National Historic Site. 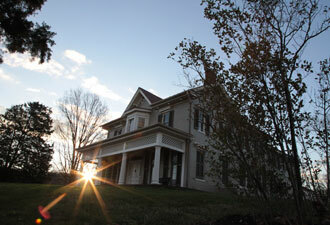 The house faces north, the direction he fled in his escape from slavery in 1838. To the east lies the Maryland border. The District of Columbia dominates the western skyline, providing a spectacular view of the US Capitol. Douglass served the federal government as a US Marshal, Recorder of Deeds for Washington, DC, and as US Minister to Haiti. 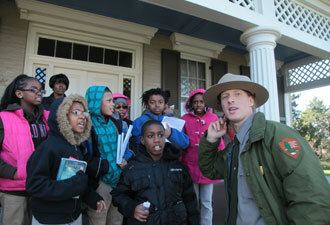 In Douglass' day a butler ushered visitors into the house; today a park ranger performs that service. Aside from the ranger, nearly everything in the house appears as it did more than a century ago. The estate is fortunate to own a majority of original artifacts. Just as in his day, visitors are escorted to the reception area of the formal east parlor. Immediately, it is clear that Douglass was a Victorian gentleman of refined tastes. Neoclassical sculptures and Romantic paintings decorate the room as well as images of the people who called Cedar Hill home. On one wall hangs a portrait by a fellow women's rights activist, depicting Douglass as US Marshal. On another hangs a picture of his first wife, Anna Murray, who paid for Douglass' escape from slavery. A third wall displays a photograph of his second wife, Helen Pitts. She married the widower Douglass and made sure that his home was preserved after his death. 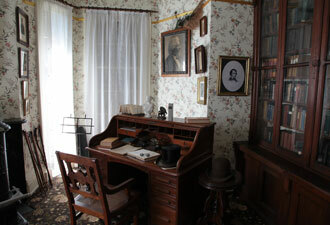 Just off the east parlor sits Douglass' library, where the man of letters spent his mornings. Douglass knew that knowledge was power: his former master had forbidden him an education, so he taught himself how to read and write. His collection of more than 1,000 titles includes William Shakespeare's plays,Alexandre Dumas' adventures, and scholarly works on anthropology and politics. The rest of the house gives a glimpse into Douglass' domestic side. He played violin and enjoyed time with his grandchildren in the west parlor. He entertained guests in his fine dining room. After buying the house, he added a pantry, laundry room, kitchen, and storage rooms. Upstairs are six bedrooms. A pair of shoes in his bedroom reminds visitors that the Frederick Douglass walked these very same halls. An author of three autobiographies, Douglass used the story of his life to fight for a more just world. At Frederick Douglass National Historic Site, his story lives on, inspiring new generations to continue his struggle. Learn more about African American history. The African American Experience Fund supports and preserves African American history found in national parks.